GEORGIA – It seems like a hack exists for everything these days. From a quicker way to wash your car to unusual ways to remove wood scuffs, there’s a shortcut for doing just about all your everyday chores better, faster, or cheaper. What about at work, though? If you’re pumping slurry, GIW Industries has got you covered. From GIW come five tips for pump maintenance. 1.Avoid cavitation the easy way. Hear a popping noise while your pump is operating? If it sounds like popcorn, you’re hearing vapor cavities imploding — and they’re as destructive as they are noisy. These tiny pockets of air are formed when the absolute pressure at the eye of the impeller reaches the vapor pressure of the liquid. Their continuous popping can result in costly damage to your impeller and bearings. Avoiding cavitation is easy if you have the right pump. You need to know the required critical suction pressure – or net positive suction head (NPSH) – for your system and choose a slurry pump that operates clear of that pressure. 2.Determine your GIW cartridge bearing assembly’s oil level with a glance. 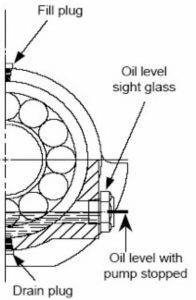 If you’re curious about your oil level, all you have to do is find your oil level sight glass. Your oil level should be at the center line. Just remember: Never check the oil while the pump is running. 3.Install a snap ring gasket – in a snap! The snap ring gasket on a GIW LSA pump seals the joint between the suction liner and pump casing. To replace it, make sure the part number is facing out, lubricate it using a non-petroleum-based lubricant such as dish soap or baby powder, and make sure it’s facing the right direction. Then, ensuring this trapezoid shaped gasket is in the right spot is simple: Pull it up, and if it “snaps” back into place, it’s installed correctly. 4.Simplify impeller removal. Struggling to get your impeller off its shaft? When you have one gasket, the torque from start-ups will cause it to stick to both the impeller and shaft, making it difficult to separate during maintenance. However, we’ve got a quick and easy fix: Simply use twoaramid gaskets between the impeller and shaft sleeve instead of one. This way, one gasket will bond to the shaft and the other to the impeller, making removals quick and easy. 5.Make sure your nose gap is right on the nose. It’s may be a small maintenance task, but properly and regularly adjusting your nose gap can easily double or triple the wear life of your parts. The correct clearance, which is very small, allows the pump to maintain a high pressure at the outside of the impeller and a low pressure at the eye. However, as the pump operates, this nose gap increases incrementally, disrupting the pressure distribution and encouraging particles to recirculate around the impeller suction shroud. To save the wear and tear on your impeller and suction liner, adjust the nose gap once a week. It’s ultra-quick: Start by loosening the hold-down bolts on the back of the bearing assembly, then use your adjusting screw and nut to move the bearing assembly forward until it touches the liner, taking care to back it off slowly to the prescribed distance for your pump. Voilà – the perfect nose gap! Pump hacks like these may require outside-the-box thinking, but that’s what makes them great! At GIW, we’re always trying to come up with new ways to simplify your pumping processes and maintenance procedures. With a little creative guidance – and a great pump – you’ll be operating longer and more cost effectively, so you’ll have more time to focus on production. Read more slurry pump hacks at http://campaign.KSB.com/blog.